[S136] Letter from Edwin Prockter to Stuart Pask dated 11 February 2004. [S285] Website FamilySearch Internet (http://www.familysearch.org) : Batch No. M062361. [S1541] Letter from Peter Talbot-Ashby to Stuart Pask, dated 2 September 2005. [S1595] Image of the 1861 Census for 59 Clements Lane, St. Clements Danes, Westminster, London: RG9 Piece 0178 Folio 49 Page 3. [S3858] Copy of the marriage certificate of Henry Frost Paske and Ann Perry, 29 May 1820. Obtained from www.ancestry.co.uk. [S5011] Website London (LMA) Marriages & Banns 1754-1921 Henry Frost Paske Spouse Name: Ann Perry Record Type: Marriage Marriage Date: 29 May 1820 Parish: St Anne, Soho County: Middlesex Borough: Westminster. [S5010] Website London (LMA) Births & Baptisms 1813-1906 Henry Frost Pask Record Type: Baptism Estimated Birth Date: abt 1822 Baptism Date: 26 May 1822 Father's name: Henry Frost Pask Mother's name: Ann Pask Parish or Poor Law Union: St George the Martyr Borough: Southwark Born: 13 May 1822 Abode: Lime Street Father's Occupation: Umbrella Maker. Source City of London Burials 1754-1855. [S5010] Website London (LMA) Births & Baptisms 1813-1906 Joseph Basham Pask Record Type: Baptism Estimated Birth Date: abt 1827 Baptism Date: 15 Apr 1827 Father's name: Henry Frost Pask Mother's name: Ann Pask Parish or Poor Law Union: Horselydown St John Borough: Southwark Born: 7 Mar 1827 Abode: Fair Street Father's Occupation: Umbrella Maker. [S3498] E-mail from Helen Freeman to Stuart & Teresa Pask dated 13 June 2009. [S3859] Image of the 1841 Census for Bury St. Edmunds, Suffolk: HO107 Piece 1088 Book 8 Folio 23 Page 38. Enumerated incorrectly under the name of PARK. [S4] GRO Indexes to Deaths. "1862/Q1 PASK, Ann Strand 1b 340." [S2485] GEDCOM file created by Julian Bennet, 23 August 2006. [S4] GRO Indexes to Deaths. "1839/Q2 Braintree 12 11." [S4789] Transcript of the marriage of George Spurgeon Junr and Martha Elizabeth Pask, 5 July 1864. Kindly provided by Marion Hopkins - GOONS Marriage Challenge. [S3] GRO Indexes to Marriages. "1864/Q2 PASK, Martha Elizabeth Braintree 4a 471 or Braintree 4a 473. There is two entries." [S4] GRO Indexes to Deaths. "1864/Q2 PASK, Emily Spurgeon W. Ham 4a 6." Research Note: Edwin wrote: "William married again after the death of Hannah, to Elizabeth COOPER at Hundon 19th January 1831. The Parish Registers of Hundon were badly damaged in a fire at the church about 1913, so some entries are incomplete. A copy of the BTs is now available at Bury SE RO which covers some or the years which were lost, but there are still large gaps.1"
[S1146] E-mail from Heatha to Stuart & Teresa Pask dated 28 February 2005. [S136] Letter from Edwin Prockter to Stuart Pask dated 11 February 2004: Rec: 14 August 1803. [S423] Transcript of the Burial Registers of Kedington, Suffolk, compiled by Edwin Prockter. "28.04.1817 Susan PASK, age 34." 1804 Thurlow Great, Suffolk: PASK, John = BULLEN, Susan. [S421] Transcript of the Baptism Registers of Kedington, Suffolk, compiled by Edwin Prockter. "17.11.1805 Henry to (John & Susan ?) PASKE, not clear entry." [S421] Transcript of the Baptism Registers of Kedington, Suffolk, compiled by Edwin Prockter. "20.03.1808 John to (John & Susan ?) PASKE, date & details not clear." [S1377] Baptism Registers Indexed transcript, Kedington, Suffolk, Baptisms 1563-1812 "1811 Jun 30 PAKE? Catherine, daughter of John and Susan (BULLEN), born 26 June." [S421] Transcript of the Baptism Registers of Kedington, Suffolk, compiled by Edwin Prockter. "20.03.1814 Hannah to John & Susan PASK." [S421] Transcript of the Baptism Registers of Kedington, Suffolk, compiled by Edwin Prockter. "10.04.1817 George to John & Susan PASK." [S285] Website FamilySearch Internet (http://www.familysearch.org) : Batch No. C132221. [S423] Transcript of the Burial Registers of Kedington, Suffolk, compiled by Edwin Prockter. "15.04.1817 George PASK age 7 days." [S423] Transcript of the Burial Registers of Kedington, Suffolk, compiled by Edwin Prockter. "18.04.1850 Elizabeth PASK, age 56." [S6] Teresa & Stuart Pask's Guesses, Theories and Speculations: Based on year, and place of marriage. [S422] Transcript of the Marriage Registers of Kedington, Suffolk, compiled by Edwin Prockter. "John PASK wid to Elizabeth COOTE botp." 1819 Kedington, Suffolk: PASKE, John = COOT, Elz. [S5500] Website Parish Records Collection 1538-2005 (www.findmypast.com) : 10 Nov 1819 Kedington Suffolk: PASKE, John (Widower) = COOTE, Elizabeth. [S423] Transcript of the Burial Registers of Kedington, Suffolk, compiled by Edwin Prockter. "25.07.1849 John PASK, age 68 (PASK or PARK)." [S4] GRO Indexes to Deaths. "1850/Q2 PASK, Elizabeth Risbridge 12 281." [S365] E-mail from Ruth Selman to Stuart & Teresa Pask dated 28 February 2004. Research Note: Beatrice and John EMMINS were the 7xgreat grandparents of Ruth Selman (Source #365). [S366] Contact through Website Genes Reunited (http://www.genesreunited.co.uk) : The Family Tree of Lynn McDonald. [S845] Letter from Pat Maybrey to Stuart Pask, dated 15 November 2004 Newchurch Baptisms: 1794 27 Apr James son of William/Ann PASK. [S2904] PASKEs of Monthmouthshire Family Trees compiled by Sylvia Rycroft, dated 4 December 2007. [S1930] Descendancy Narrative of James Pask compiled by Lynn McDonald on 5 January 2006. [S845] Letter from Pat Maybrey to Stuart Pask, dated 15 November 2004. 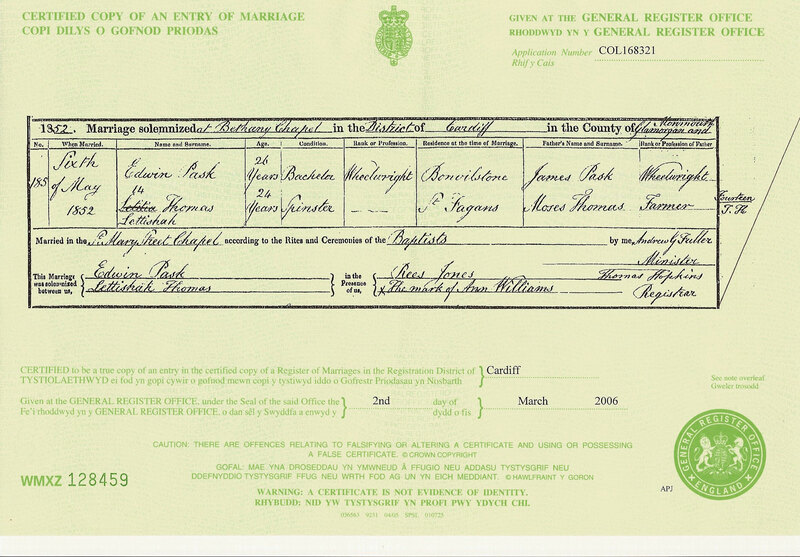 [S1866] Copy of the marriage certificate of James Pask and Ann Morgan, 28 September 1818. Kindly provided by Lynn McDonald. Married 22 September 1818 at the Church of the Holy Cross, Kilgwrrwg, Monmouthshire. [S367] Website Kilgwrwg Baptisms (http://freepages.genealogy.rootsweb.com/~monfamilies/…). [S1603] Image of the 1841 Census for Kilgwrrwg, Monmouthshire: HO107 Piece 747 Book 7 Folio 3-4 from Archive CD Books. [S446] E-mail from Clive Hill to Stuart & Teresa Pask dated 15 November 2005. [S1867] Image of the 1851 for Upper House, Kilgwrrwg, Monmouthshire: HO107 Piece 2443 Folio 169 Page 21. [S1540] Image of the 1861 Census for Cottage, Kilgwrrwg, Monmouthshire: RG9 Piece 3975 Folio 43 Page 10. [S4] GRO Indexes to Deaths. "GRO Online Index: 1862/Q3 PASK, James Chepstow 11a 1 age 66." Buried 3 July 1862 in the Church of the Holy Cross, James Pask of Kilgwrrwg, aged 66. [S4] GRO Indexes to Deaths. "GRO Online Index: 1872/Q2 PASK, Ann Chepstow 11a 1 age 70." Wit: John Smith & Ellen Davis. 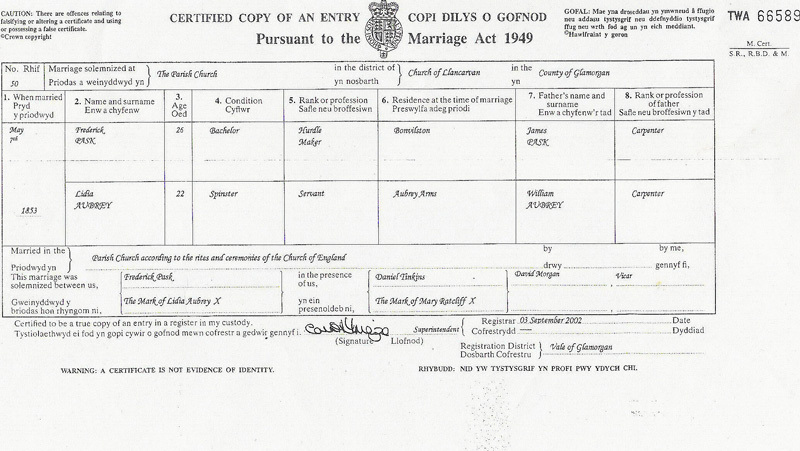 [S367] Website Kilgwrwg Baptisms (http://freepages.genealogy.rootsweb.com/~monfamilies/…) : Parents given as James & Cecily? [S1987] Copy of the marriage certificate of Edwin Pask and Lettishah Thomas, 6 May 1852. [S1865] Copy of the marriage certificate of Frederick Pask and Lidia Aubrey, 7 May 1853. Kindly provided by Lynn McDonald. [S367] Website Kilgwrwg Baptisms (http://freepages.genealogy.rootsweb.com/~monfamilies/…) : "24/09/1837 Hezekiah James & Anne Pask Kilgwrwg Carpenter." Wit:- Chas Stockham; Jane? West Banns. [S1863] Image of the 1871 Census for Kilgwrrwg, Monmouthshire: RG10 Piece 5293 Folio 62 Page 14. Buried 8 April 1872 in the Church of the Holy Cross, Ann Pask of Kilgwrrwg, aged 70. [S2] GRO Indexes to Births. "GRO Online Index: 1837/Q3 PASK, Herekiah MORGAN Chepstow 26 44 (Name should read Hezekiah)." [S367] Website Kilgwrwg Baptisms (http://freepages.genealogy.rootsweb.com/~monfamilies/…) : "28 Jan 1820 Timothy James & Ann Pask Kilgwrwg Carpenter." [S845] Letter from Pat Maybrey to Stuart Pask, dated 15 November 2004 (IGI). [S384] Website FamilySearch Internet (http://www.familysearch.org) : The IGI gives the date as 23 March 1840, this is incorrect and probably 23 March 1848. [S3] GRO Indexes to Marriages. "1848/Q2 PASK, Timothy = REES, Mary Ann Chepstow 26 65." Married 23 March 1848 at the Church of the Holy Cross, Kilgwrrwg, Monmouthshire. [S1932] Image of the 1851 for Goldenhill, Llangwm Ucha, Monmouthshire: HO107 Piece 2443 Folio 180 Page 13. [S1334] Image of the 1861 Census for Kilgwrrwg, Monmouthshire: RG9 Piece 3975 Folio 34 Page 15. [S1931] Image of the 1871 Census for Tygwin Cottage, Llangwm Ucha, Monmouthshire: RG10 Piece 5293 Folio 49 Page 11-12. [S846] Image of the 1881 for Llangwm Ucha, Monmouthshire: RG11 Piece 5218 Folio 57 Page 9. [S4] GRO Indexes to Deaths. "1894/Q1 PASK, Timothy Chepstow 11a 1 age 74." [S742] Website Llangwm Baptisms, Monmouthshire (http://freepages.genealogy.rootsweb.ancestry.com/… ) 5 August 1849 Thos s/o Timothy & Mary Anne Pask, Golden Hill, Llangwm Ucha, farmer. [S2963] Website Kilgwrwg Baptisms (http://freepages.genealogy.rootsweb.com/~monfamilies/… ) "16 Sep 1855 James Timothy & Mary Anne Pask Kilgwrwg Labourer." [S4] GRO Indexes to Deaths. "1901/Q3 PASK, Mary Ann Chepstow 11a 3 age 73." [S367] Website Kilgwrwg Baptisms (http://freepages.genealogy.rootsweb.com/~monfamilies/…) : "17/11/1822 Mary Ann James & Ann Pask Kilgwrwg Lab." [S845] Letter from Pat Maybrey to Stuart Pask, dated 15 November 2004 Baptism: 20 Nov1822 Mary Ann PASK, d/o James & Ann. [S367] Website Kilgwrwg Baptisms (http://freepages.genealogy.rootsweb.com/~monfamilies/…) : "13/05/1827 Frederick James & Anne Pask Kilgwrwg Carpenter." [S1934] Image of the 1851 Census for Bonvilstone, Glamorganshire: HO107 Piece 2456 Folio 94 Page 15. Indexed incorrectly under the name of PARK. [S3] GRO Indexes to Marriages. "1853/Q2 PASK, Freadrick Cardiff 11a 361." [S1604] Image of the 1861 Census for St. John, Cardiff, Glamorganshire, Wales: RG9 Piece 4031 Folio 53 Page 31. [S1933] Image of the 1871 Census for St. Johns, Cardiff, Glamorganshire: RG10 Piece 5356 Folio 59 Page 13. Indexed incorrectly under the name of PACK. [S747] Image of the 1881 Census for Blackweir, St. John, Cardiff, Glamorganshire: RG11 Piece 5276 Folio 30-31 Page 16-17. [S4] GRO Indexes to Deaths. "1887/Q4 PASK, Frederick Cardiff 11a 193 age 61." [S4999] Website UK Government Probate Search Service: The Will of Frederick Paske late of the "Machen Forge" Inn in the Parish of St. John the Baptist in the Town of Cardiff in the County of Glamorgan Licensed Victualler who died 21 December 1887 at the "Machen Forge" was proved at Llandaff by William Llewellyn of the Ton in the Parish of Eglwysilan in the said County Woodman and Ann Lewis (wife of John Lewis) of the "Machen Forge" the Daughter the Executors. [S3111] Index to Baptisms, compiled by Glamorgan Family History Society, extracted - print out dated 27 January 2008. [S748] Image of the 1891 Census for St. John, Cardiff, Glamorgan: RG12 Piece 4391 Folio 101 Page 3. [S4] GRO Indexes to Deaths. "1892/Q1 PASK, Lydia Cardiff 11a 223 age 63." [S1343] Image of the 1871 Census for Higher Newcastle, Glamorganshire: RG10 Piece 5420 Folio 50 Page 68.